Search engines can drive a lot of visitors (read: potential buyers) to an e-commerce site. But if you think good text is all you need to score a high search-engine ranking, you haven't looked closely at search-engine results lately. Search results are no longer limited to blue text links. Search engines now integrate feeds from specialized areas, such as news, pictures, and video, into many search query results. New tagging technology promises to make it easier for others to find and access multimedia and other specialized content on your Web site. It's important for your connected business to take advantage of these developments in Web technology and search engines. Universal search, which blends multimedia and news content with traditional search engine results, was a hot topic at last week's Search Engine Strategies conference in Toronto. Everyone knows that being number one in a search engine for a popular keyword, or search term, can attract thousands of clicks. But what constitutes number one in universal search these days? Is it the sponsored pay-per-click ad splashed across the top of the page, the first text link, the top news link, or an eye-catching photo or video featured in the results? All get their share of clicks. So the savvy Web site marketer should consider ways to make all components of a site's digital assets (text, pictures, and video) rank highly. Masked by the distraction of Microsoft's on-again, off-again takeover bid for its parent company, Yahoo's search engine is innovating behind the scenes. Yahoo's new, and free, SearchMonkey tools for Web developers, recently out of beta testing, open up the search engine to user-developed content. The tools offer ways of highlighting your search-engine presence with added features, such as a photo or rating. 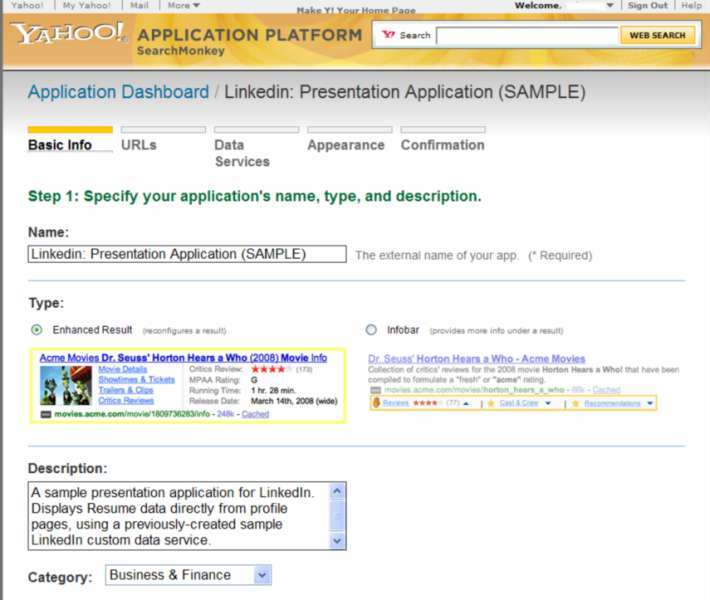 Yahoo SearchMonkey comes with sample tools, including an application that works with LinkedIn listings. SearchMonkey offers several ways to accomplish this. If you've got some software development skills, you could create a small program in PHP, a common Web scripting language that is supported by most Web hosts. SearchMonkey also offers some sample apps, including one that works with LinkedIn listings to add r&#233;sum&#233; data to a search listing. For many small-business owners, the easiest way to improve rankings may be to mark up existing Web pages with new, more descriptive tags that Yahoo will automatically pick up when it indexes pages. The use of tags is Yahoo's take on building a smarter, so-called Semantic Web, which permits easier, even&#160;automatic sharing of all types of data. Think of it as an extension of the current Web with a layer of electronic glue that helps other sites better access the data on your pages. If you don't rank highly for a certain keyword, using SearchMonkey won't help.&#160;But if you make your listing stand out from the crowd by enhancing it--by adding a photo, for example--you may be able to get more visitors to click on your link. SearchMonkey now works only on Yahoo's search engine listings. However, it's such a good idea that I would be surprised if Google doesn't come out with something similar to take advantage of the Semantic Web. Since universal search results go beyond straight text, how do you optimize your other digital assets, such as videos, for search engines? Some businesses have found that uploading a video clip to YouTube (now owned by Google) can pay off. You can tag each video so it can be found under relevant YouTube searches. Google includes links to some YouTube videos in its regular search results. Uploading existing videos to YouTube is one thing. But is it necessary to invest time and money&#160;in creating new videos to have a complete presence in universal search? The answer&#160;depends partly on&#160;what type of business your site is supporting. "A small business doesn't necessarily need to do videos," says Jill Whalen, CEO of High Rankings, a Boston-area search engine optimization (SEO) consulting firm. "There are so many things most business owners need to do to their Web sites before they get to that stage. Do the basics of SEO first." But, she adds, "perhaps for some local businesses there are opportunities there: A 'how-to' if you're a plumber or an electrician. You could make some videos which could show up in the local listings." News listings are also integrated into some search results. Your business doesn't require a write-up in the New York Times to be deemed newsworthy. Issuing a news release and distributing it online may be enough to qualify for indexing as a news item, which could attract more visitor traffic. The key lies in writing the news release for the Web, mentioning keywords related to your content, and including hot links to your site. As more Internet users upgrade to broadband connections, search engines will move to include even more multimedia content in their results to appeal to these high-speed users. Consider how you can position your company's Web site to benefit from this trend. Semantic Web technology can enhance the value of the data on your Web site, by making it more easily shared by other communities and accessed by automatic tools.&#160;While a&#160;relatively small number of sites currently take advantage of the Semantic Web's opportunities, keep in mind that&#160;this emerging technology standard is supported by the World Wide Web Consortium (W3C) and appears poised to be the next step in the evolution of the HTML Web.